PRODUCT: Sievert #TI2960, Premium Titanium Torch Kit. Price/Kit. 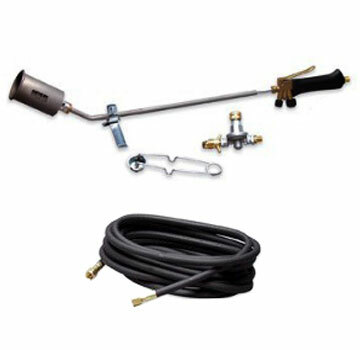 FEATURES: Lightweight Propane Torch Kit with accessories. Designed for Roofing. Made of high quality TA2 Titanium - 60% lighter in weight. Torch offers a fully adjustable pilot flame/main flame torch for more accurate work. Kit includes 32 in. titanium torch assembly with stand, 25 ft. hose, P.O.L. regulator and spark lighter. Heat Capacity: 225,000 BUT @ 28 psi, 375,000 BTU@57 psi. 3460-TI Titanium 32" Torch assembly with stand. #1525IS 25ft. UL Listed Propane Hose. #3062-93 Adjustable regulator 28-57 PSI.